1. Close to 50% of companies missed expectations and approximately 45% revised forward earnings downwards, with dividend payout ratios now higher than at the depths of the GFC. 2. Banks hurt on capital raisings and regulatory changes. 3. Resource stocks lower on falling commodity prices, but actual results quite solid. 4. Supermarkets under pressure on declining margin expansion, healthcare sector earnings expectations push higher. 5. Industrials earnings revised lower on poor operating conditions and slowing economy. According to Bloomberg, about half the companies reporting beat analyst expectations, whilst 48.7% missed expectations. Prior to reporting season, consensus estimates of earnings per share (EPS) for the 2015FY was 0.8%, whilst at the end of reporting season, EPS growth was negative 1.8% year on year. This was mainly due to the resources and energy sector, where EPS fell 20%. EPS growth expectations for 2016FY have now come in from 4% to 3.2%, with resources at negative 12%, banks/financials 3%, and industrials coming in from 10% to 7%. 45% of companies guided earnings expectations down more than 2% over the next 12 months versus 18% guiding up over 2%. This compared to 31% and 22% respectively six months ago, and 27% and 28% respectively this time last year. Once again, dividends grew at a faster pace than earnings. EPS has now grown at 5% since 2011FY, but dividends have soared by 25%. 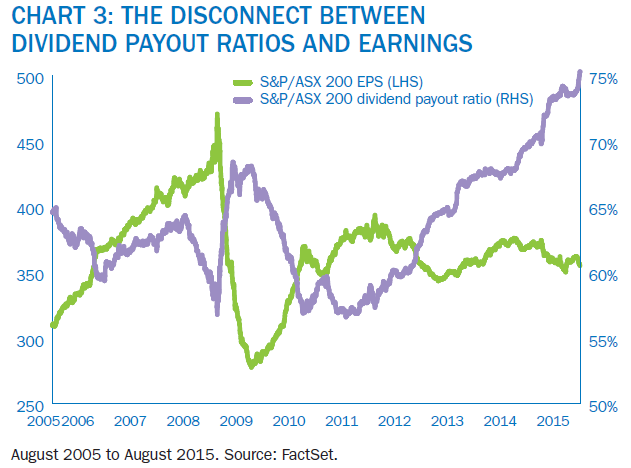 Dividend payout ratios have spiked to 75%, which is higher than at the depths of the GFC. Payout ratios at these levels are unsustainable without a lift in earnings. We saw large equity issuance from the big 4 banks along with hybrid security issuance, due to increased capital requirements. CBA raised $5bn, with $3bn from ANZ, following on from NAB’s $5.5bn in May and WBC’s $1.25bn hybrid issue. Whilst this issuance strengthens bank balance sheets, it also highlights their declining earnings. Resource stocks continued to fall in the reporting period on falling commodity prices and concerns regarding the Chinese growth outlook. Earnings were strongly down and market expectations are for another 12% fall in EPS growth in the sector. In saying that, the big miners are aggressively cutting costs and continue to lower their costs of production, assisting their balance sheets and increasing their chances of maintaining current high dividends. Their cash results were quite strong with operating cashflow and free cashflow exceeding expectations. Supermarkets struggled in light of increasing competition and falling margins. 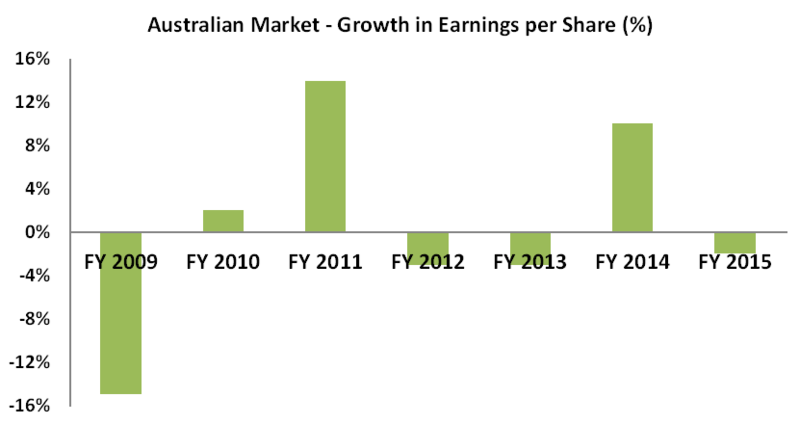 However, Wesfarmers bucked the trend and actually increased headline sales and margins. Only a couple of sectors saw an aggregate increase in expectations. Healthcare was one of those, however, the sector remains relatively expensive from a valuation perspective. The biggest surprise from reporting season came from Industrials, with EPS growth expectations coming down from 10% to 7%, at a time when the industrials sector is trading on some of highest valuations we’ve seen in years. The downgrade reflects the slowing Australian economy. Australian equites look fair value at present. Now is certainly not the time to be reducing Australian equity exposure, but we’re also unsure about increasing exposure in the current environment. If truly investing for the long term (by this, we mean 5 to 10 years), then putting some additional cash to work in Australian equities now makes a lot of sense with valuations reasonable, low interest rates (which will persist for some time), and a much lower Australian dollar. 1. The difference in valuations between sectors – industrial stocks look really expensive, as do healthcare and utility stocks, whereas financial and materials stocks look reasonable value. The former sectors are defensive, whilst the latter are cyclical and higher risk. 2. The earnings growth outlook – energy and material stocks are still working their way through falling earnings growth, whilst the earnings growth outlook for consumer staples, financials and telecoms looks anaemic. The rest of the sectors have reasonable earnings growth expectations, but the probability of downward revisions in these estimates is higher than we would like. Effectively, the unloved sectors and those with cyclical headwinds, are the ones looking the best value on a long term basis, but the operating environment will remain tough for them in the short term. 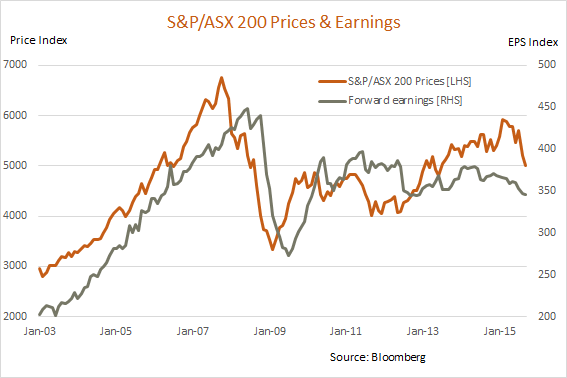 Overall, there isn’t enough earnings growth coming through to support a significant rise in Australian stock prices in the near term, but prospects do look good for the longer term. Please don't hesitate to contact us if you'd like to discuss this further with your Financial Adviser.